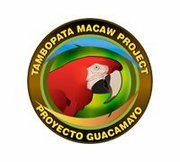 The Tambopata Macaw Project is a long term research project on the ecology and conservation of macaws and parrots in the lowlands of southeastern Peru. Through this page we hope to communicate parrot field research to a wider audience. The Tambopata Macaw Project has been working with wildlife and local communities since 1989 with the goal of studying the ecology and natural history of large macaws so that this information could be used to help protect them throughout the tropics. A long history of dedicated research and monitoring has provided many insights into various aspects of parrot and wildlife of south eastern Peru.